Nearsightedness, clinically called “myopia,” is a very common vision problem. The commonly used term “nearsighted” is a simple way to understand myopia. Those who suffer from it are able to see nearby objects more clearly than far away objects. Usually nearsightedness is caused by an eye that is too long. The irregular shape of the eye causes incoming light rays to focus in front of the retina rather than directly on it. As a result, images of distant objects appear blurry. Nearsightedness varies in severity and can be an obstacle in daily life. Recognizing friends, safely driving, or simply seeing a movie can prove to be a challenge if you suffer from myopia. Many people treat their condition with the use of glasses or contacts which help to refocus light and create clearer images. For those who are looking for a more long term solution, Visian ICL (implantable collamer lens) is a great choice for correcting myopia. Farsightedness, clinically called “hyperopia,” is another common vision problem. Someone who is considered “farsighted” can be described as more able to see distant objects when compared to objects that are closer. Farsightedness should not be confused with presbyopia, the condition in which reading nearby objects becomes more difficult, which naturally occurs in everyone as they age. Farsightedness which is typically called by an eye that is too short. This irregularity in eye shape causes the incoming light rays to focus behind the retina rather than directly on it. As a result, images of near objects appear more blurry. 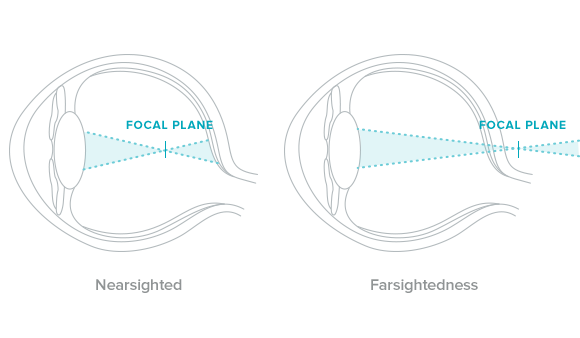 As farsightedness also varies greatly in severity, it can also play a role in hindering daily life. Many people who suffer from hyperopia have difficulty working on computers, reading or any other activity that require close up vision. Farsightedness is also commonly treated with glasses or contacts to help refocus light properly in their eye. Astigmatism is caused by an irregularly shaped cornea. Instead of having a symmetrically round shape (like a baseball), it is shaped more like a rugby ball, with one meridian being significantly more curved than the meridian perpendicular to it. This irregular shape causes the light rays to focus on multiple focus points either in front of or behind the retina (or both) as a result images are blurred or distorted to some degree at all angles. Prescription eye wear is effective for correcting astigmatism because the corrective lens can refocus the incoming light and create clearer images. Unfortunately, glasses and contacts are not a permanent solution for correcting astigmatism since they only work when they are being worn. While effective for short-term or temporary vision correction glasses and contact lenses have their downsides. They usually can’t be worn at all times and are easily misplaced or damaged, which means many people will find themselves in situations where their vision is compromised. Many people who are near-sighted or farsighted with or without astigmatism seek out alternative solutions for correcting their vision challenges. The ICL procedure provides an appealing option for correcting many common visual problems. ICL can provide you the freedom to live a life uninhibited by the day to day lifestyle demands of glasses or contacts.